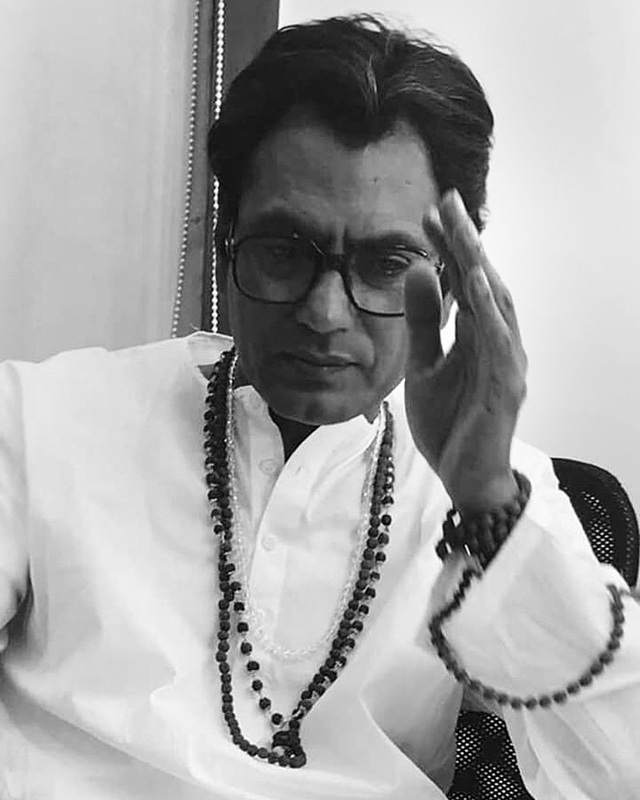 IMAGE: Nawazuddin Siddiqui as Shiv Sena founder Bal Thackeray in the biopic Thackeray. Nawazuddin Siddiqui is grateful for the opportunity to play Shiv Sena founder Balasaheb Thackeray in a biopic. Starring Nawazuddin in the title role, Thackeray, penned by Shiv Sena MP Sanjay Raut, is directed by Abhijit Panse. "I think any actor would have agreed to play his role," Nawaz said at the launch of a teaser for the film, which was launched by Amitabh Bachchan. "Everyone would be thinking how can I speak Marathi, let me tell you, Bal Thackeraysahab would be giving me inspiration and would be showering his blessings (on me) to play the part," Nawaz said, speaking in Marathi on video from an overseas location where he is shooting for a film. IMAGE: Director Abhijit Panse, Rashmi Thackeray, Shiv Sena President Uddhav Thackeray, Amitabh Bachchan and Sanjay Raut at the teaser launch of Thackeray. "I don't think Balasaheb's life can be shown in three hours," Bachchan felt. "I wish there is a series made on him of three-four hours, for his personality, work, life is much beyond a film. I feel it should be shown in a Web series of many episodes." 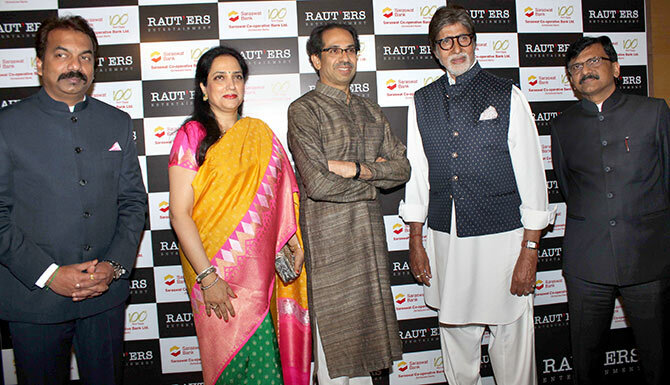 Bachchan said he looked upon Thackeray as a father figure. "We were very close to each other, we were more like family. I respect him a lot," he added. 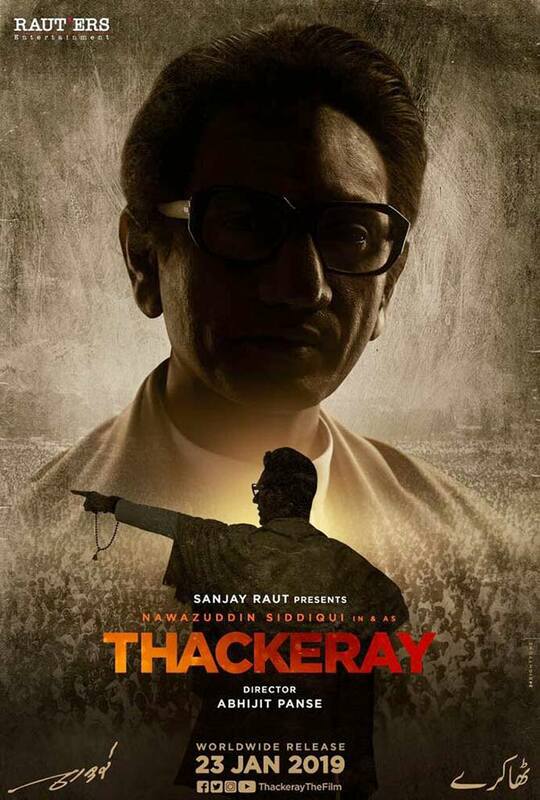 IMAGE: The poster for Thackeray. Thackeray, Bachchan said, stood by him in tough times. "I was hurt during the shoot of Coolie and was hospitalised in a critical state in Bengaluru and when I was being brought to Mumbai, the days weren't good due to the monsoon." "I did not get an ambulance at that time, due to rain, but Balasaheb's Shiv Sena ambulance was available. If this did not happen, I could have been more in danger," he recalled. "There were instances in my life when there were some allegations on me. Balasaheb used to call and ask if it is true or not. One such incident happened when there were allegations on me and my family and Balasaheb called and asked what is the truth. I told him I am telling the truth. He told me don't be afraid, I am with you," Bachchan remembered. "No one stood by me as much as he did," the actor said. The biopic will release on January 23, 2019, Thackeray's 92nd birth anniversary. Should I be running on that treadmill? Seen so many telly stars?